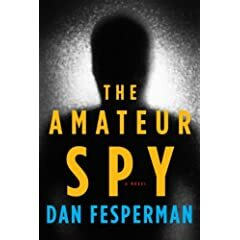 Dan Fesperman's The Amateur Spy is a spy thriller set in the contemporary world, a book that not only entertains but also speaks out about the state of current world affairs. Fesperman's novel transcends the formulas. He uses suspense to draw you into the world in which his characters live, which unsettlingly happens to be the one we live in, too. As a foreign news reporter for the Baltimore Sun, Fesperman witnessed his share of the world's conflicts in Bosnia, Afghanistan and the Middle East. And he has carried his reporter's techniques and insight into a series of novels - this is his fifth - set in those lands and elsewhere. His previous novel, "The Prisoner of Guantanamo," did more than most journalists have done to shine a light on that dark and troubling place. It's hard to imagine why some espionage writers still miss the Cold War when they have the so-called Global War on Terror to write about. Before, look-alike spies from both sides lurked at embassy cocktail parties from Paris to Tangiers. They matched wits in their own capitals, or in proxy wars across the globe, and each side knew the other inside-out. It's why double-agents were so prevalent, and so hard to root out. Wilderness of mirrors, indeed. Today, all the mirrors are broken. Most would-be infiltrators stand out right away. And you certainly can't eavesdrop on any jihadis with a cocktail in your hand. On both sides of the fight, narrow minds cook up broad ideas for places they neither know nor understand. For the West this has produced a notable misadventure at Tora Bora and a pariah prison in a squatter's corner of Cuba. It also explains why an espionage amateur, such as a former aid worker with Middle East experience, might end up being recruited in a pinch to handle a tough assignment in Jordan. Such is the premise of The Amateur Spy, a topic I settled on after having explored the previous two scenarios in earlier books, The Warlord's Son and The Prisoner of Guantanamo. Three tunes in particular always run through my head whenever I ponder today's prevailing mentality, providing a sort of drumbeat to the imagination. All three songs give me the creeps if I bother to pay attention to the lyrics. Yet, all three are easy to sing along with, which I suppose is their point: Numb them with entertainment and they'll follow you anywhere, no matter how frightening the concept. That's why I've come to think of this trio as the ultimate soundtrack for the War on Terror. It's the sing-along chorus for John Q. Public, with its get-it-done, but-don't-tell-us-how-you-did-it subtext. Improbably, all three were written in the '70s, long before we ever heard of explosive belts, or Extreme Rendition, or a cutthroat bunch of desperado zealots known as Al Qaeda. Two are from the Elvis Costello album, Armed Forces. The third is from Talking Heads 77. As for the other songs on my play list, well, they're explained below. How about the new willingness to accept harsh tactics once deemed unthinkable? Before they put you on the torture table. There's a shorthand typist taking seconds over minutes. She's picking out names I hope none of them are mine. Elvis reportedly wrote this after being outraged by the presence of British troops in Northern Ireland, but the mentality could apply to any occupying force that would rather not be there, yet feels compelled to stay in order to "fight them over there instead of at home." David Byrne's perfect take on a blissfully ignorant fellow who isn't the least bit concerned with what's going on in the centers of power as long as his life remains convenient and trouble free, with plenty of parking. Never mind the politics, this is the song that plays at a noisy taverna across the harbor of a secluded Greek island, during an opening scene of The Amateur Spy, as our hero Freeman Lockhart dines with his wife at water's edge, although in the text I simply identified it as "a blaring chorus of The Who." I tossed it in because it sums up the experience of every American who has ever crossed a great deal of water and sky to get away from it all, only to be aburptly confronted by his own culture when he least expects it. Like, for example, coming across an episode of "Martha Stewart Living" subtitled in Arabic while seated in a Palestinian refugee camp, or meeting up with a starving barefoot boy in a Michael Jordan jersey at a UN feeding station, miles from any paved road. The playing of the song, for me, summed up that feeling of instantaneous dislocation. She serves the smooth Retsina. She keeps me safe and warm. It's just the calm before the storm. I discovered both these tunes on a 1997 compilation disc, Sif Safaa: New Music From the Middle East, and they're my favorite tracks when I'm trying to settle into the right mood for setting scenes in that part of the world, the next best thing to boarding a flight to Amman. Their appeal comes partly from their rhythms, and partly from their more traditional instrumentation (the lute-like oud, the violin, the middle eastern flute known as the ney, and drumming from the darbuka and bendir). They're also evocative of the kinds of music I seek out on the AM dial whenever I'm driving or riding across Jordan, and they never fail to evoke memories of my almost daily trips to the Iraqi border in early 1991, when I spent six weeks in the country during the first part of the Persian Gulf War. That trip takes you past a crumbling Crusader fortress in Azraq which was once a billet for T.E. Lawrence. It then drones across an immense lava desert of black basalt to the forlorn outpost village of Ruweished at the Iraqi frontier. The Arabic rhythms are perfect for bouncing along in a cab with the springs shot or, if you prefer, swaying along on a camel, Beduin style. Although any Beduin these days generally prefers traveling by Toyota truck.